Munthiri Kothu | Sweet Moong dal balls is an authentic snack of Kerala, which is prepared with the roasted moong dal,grated coconut & jaggery.Some of these traditional snacks make me truly nostalgic and miles away from home,we definitely crave for them at all times. 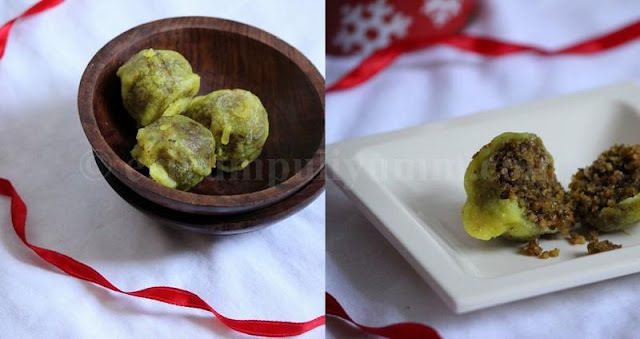 'Munthiri' in malayalam refers to grapes,'kothu' refers to bites probably;how did this snack resemble a grape?? I feel that when they are fried they have a tendency to stick to one another and resemble a bunch of grapes or after its fried,it resembles like a bunch of grapes when placed together.Anyway,what's in the name,we should know how to enjoy these,Isn't it? Munthiri kothu & Sukhiyan are both traditional snacks more or less the same but with some good differences too.Munthiri kothu has a longer shelf life over a month(if u could reserve some) and sukhiyan on the other hand stays good for two days.Munthiri kothu is prepared with roasted moong dal where as sukhiyan is prepared using boiled moong dal.Munthirikothu is crunchy and harder compared to the soft filling of sukhiyan.I tried the filling of sukhiyan and tried these sweet moong dal puffs some time back,check that out if you haven't.Munthirikothu has a crispy outer cover and sweet chewy but crunchy filling inside.The recipe is adapted from Swathi's Zesty South Indian Kitchen and modified here and there to adapt to our tastes.Thanx Swathi for the recipe,liked it.This snack is a bit time consuming but worth all the efforts.Kids and adults will equally love it,Try & Enjoy !! Wash the moong dal and drain water.Spread it on a clean kitchen towel or paper towel,let the water completely evaporate.Wait for 20 minutes. In the same pan,add the grated coconut and roast till the water content is evaporated and slightly browned.Grind this coarsely in a blender when warm.Powder the cardamom pods,mix it with coconut. 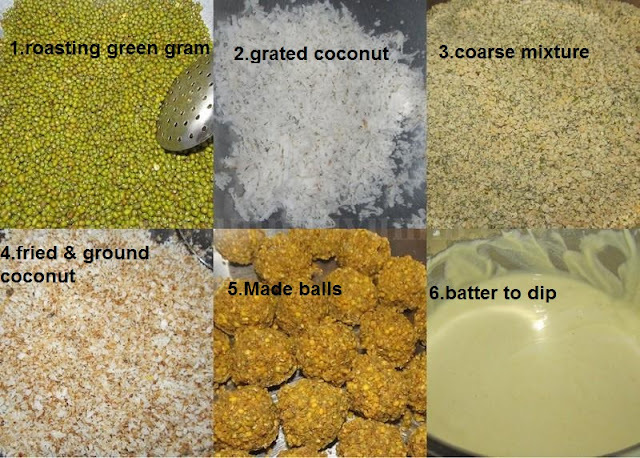 Add the coconut mixture to the moong dal mixture,add in the dry ginger powder,and cumin powder.Combine well. Heat another pan and melt the jaggery with the water.Strain to remove impurities and again bring to boil.Let it boil for 7-8 minutes until it reaches slightly lower than one thread consistency,immediately remove from fire and pour little by little in the mix.Mix it well and leave to cool till warm,start making gooseberry sized balls.Leave it for 15 minutes before you fry them. Make a batter using the ingredients for the cover; rice flour,salt and turmeric powder.The batter should be without lumps and not very thin. Heat oil in a deep kadai or wok and when the oil is hot.Drop each prepared ball in the batter and drop in the oil using hands or spoon. (hand works better)Wait for 2 minutes until you flip to the other side otherwise it might break open the cover.Keep flipping with a slotted spoon on all sides until its lightly browned.Drain with a slotted spoon and place on a paper towel. Repeat the same until finished.Serve warm with tea or store in air tight containers. 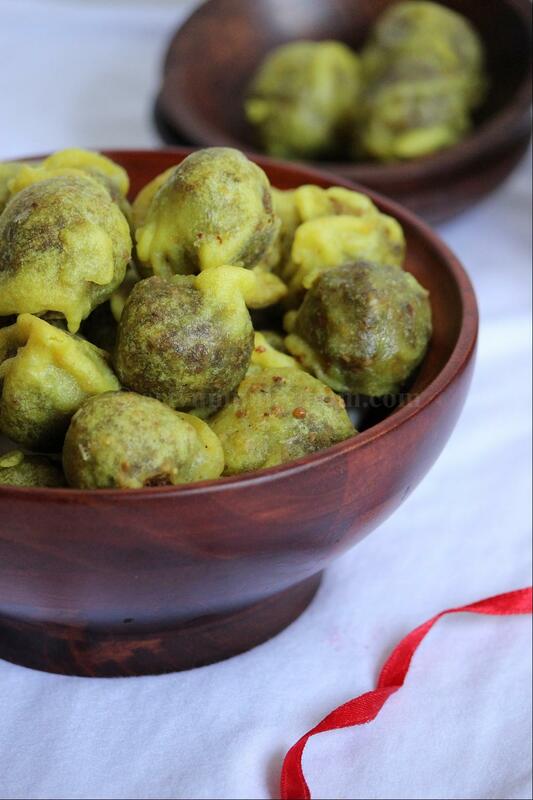 * You can use split moong dal too,but ideally whole moong dal/whole green gram is used. * If you are using blender to blend,keep it at the lowest speed or pulse and stop every 30 secs to see if done.Don't powder it very fine,the coarse texture adds the crunchiness. * This snack can be stored for over a month.But some people prepare this using maida for the cover.In that case ,it will not stay good for long days. * The balls should fully be immersed in oil. * Use dark colored jaggery for the authentic color.The consistency shouldn't exceed more than one thread consistency or else the filling will be very hard. * You can use dessicated dry coconut too.In that case you can add directly to the filling without roasting. 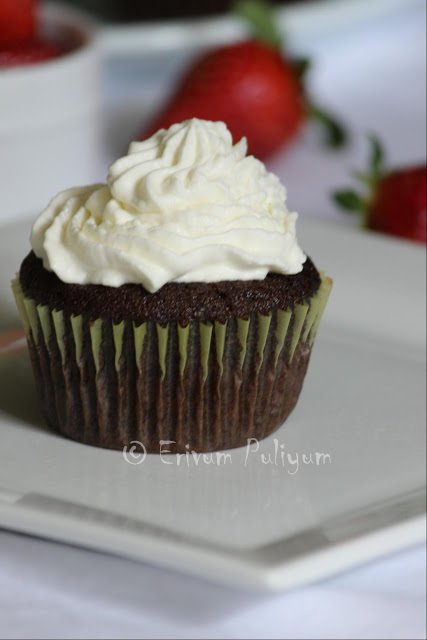 * If you are making a smaller batch,reduce the ratio of ingredients. This is similar to our Suzhiyan but we use maida for batter...this sounds more delicious n healthy with rice flour...munthiri kothu looks inviting, neatly presented! I love munthiri kothu very much dear,explained well. 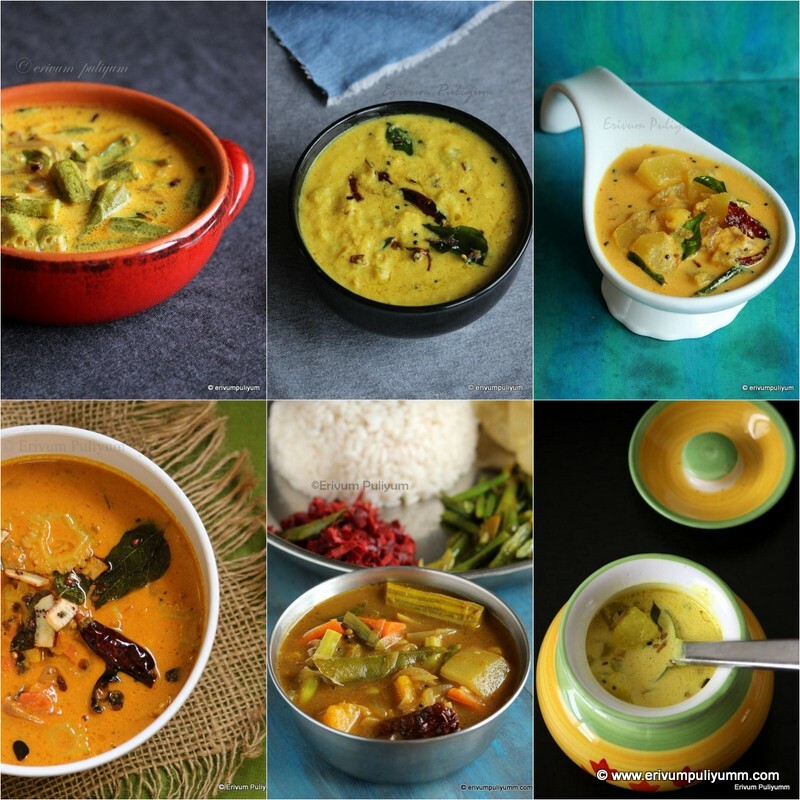 Delicious, have done this only with chana dal, have to try it with moong dal.. 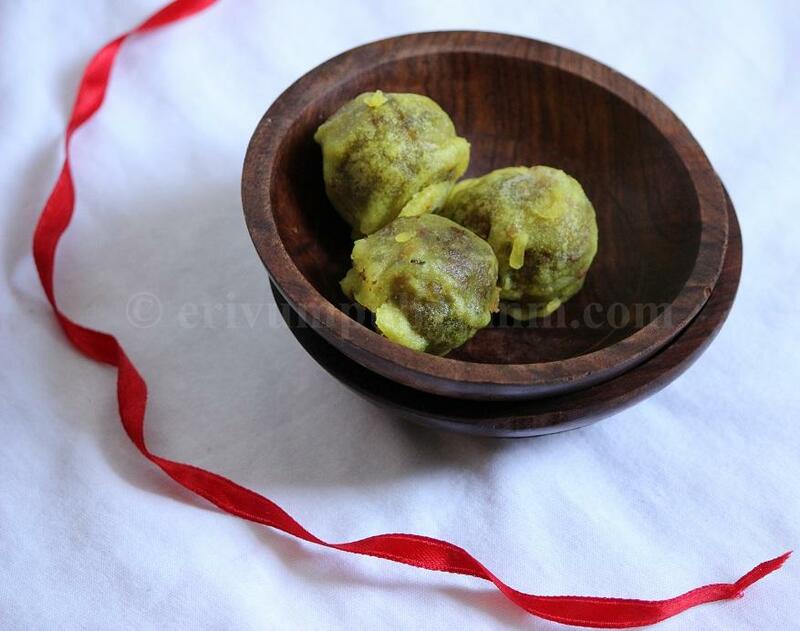 Thanks Julie for trying Munthrikothu, adipoli, it is really hard to stop eating them with one. Healthy n inviting. Looks different filling. If you follow back i will be so happy. Its been a while i had this delicious balls, cant resist to them. Have heard of this sweet a lot! But never tasted it! Healthy and delicious sweet! Never heard about this.Interesting recipe. Never heard of it. I like jaggery sweets. That's a lovely snack you've made! They look cute! a very interesting and unusual preparation. Very nostalgic Julie...I love to recall childhood days...truly a very memorable post from you dear. wow yummy!!! my grandma makes n long time back I tasted this, thanks for sharing such a traditional recipe dear!!! 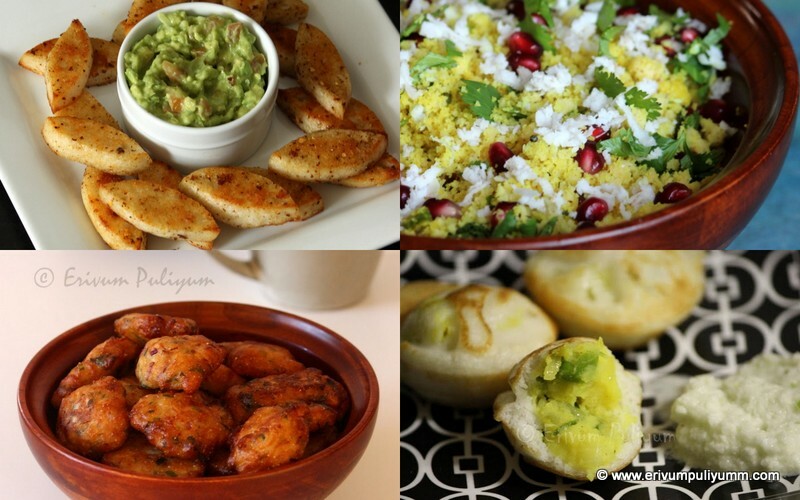 Looks yum... is it similar to sukhiyan? Makes me hungry and feel like having. My hubbys fav...comes as our tea time snack most of the time..but never have got a beautiful click of it...Yours look so perfect and lovely clicks..
yummy munthiri kothu!!! Prepared this for last X'Mas. my hubby loves this i didnt know it used green gram dal.lovely recipe. Delicious!Never tried these but they look so so good!! Had this last in college when a friend's mom made it for me. I've since wanted the recipe, but never found one. Thank you for this and the lovely step by step. A very new recipe to me!!! am bookmarking this delicious one!! never tried munthiri .... will try soon. Ooh love it. Appreciate you for capturing pictures at diff stages of cooking. 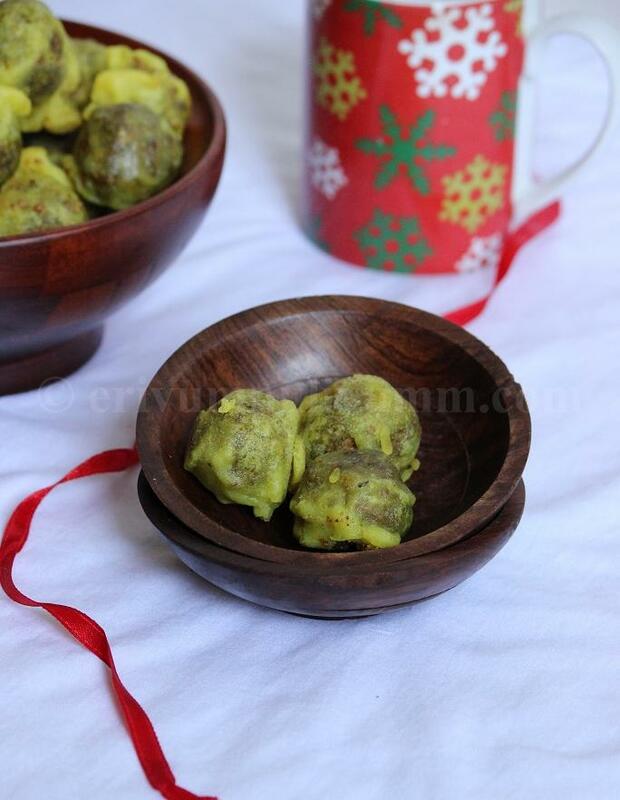 Milk(Doodh) Peda | Milk Fudge & My 400th Post ! !